Brian Willwerth – Sports Journalist | I am a writer/contributor for New England Sports Journal. On this site, I write about pretty much whatever I want. I am a writer/contributor for New England Sports Journal. On this site, I write about pretty much whatever I want. The enforcer will not be wearing the black and gold next season. Bruins’ general manager Peter Chiarelli announced Monday that Shawn Thornton, a fan favorite, will not be back for an eighth season. During his tenure in Boston, Thornton was a member of the 2011 team that won the Stanley Cup. He spent much of his time playing on the fourth line, and the fans loved his physical play. But in terms of production, there wasn’t much to talk about. He never scored more than ten goals in a season (in 2011.) He just had one assist in this year’s playoffs. Still, the lack of points wasn’t the reason Bruins fans fell in love with him over the past seven years. But he definitely knew how to rack up those penalty minutes. And then, there was the hit on Brooks Orpik that got Thornton a 15-game suspension. So with Thornton out of the mix, who will be next year’s enforcer? Or, will there even be one? The NHL’s unrestricted free agent period begins on July 1. Over the weekend, I went to the NASCAR race at Richmond International Raceway, a.k.a “The Action Track.” And there was plenty of action to go around. Here are some photos I took from my experience. Here are three takeaways from the Bruins’ 4-1 victory over the Red Wings in Game 2 of the Eastern Conference Quarterfinals. The series is now tied at a game apiece. TOTAL TEAM EFFORT. The Bruins had the edge in play for much of the afternoon. It helped that they got an early gift-wrapped goal when Jimmy Howard couldn’t clear the puck and Justin Florek scored into an open net. And when the Wings cut the lead in half in the second period, Milan Lucic had the answer five minutes later, and the home team was in control from there. POWER PLAY GETS IT DONE. Reilly Smith and Zdeno Chara each scored on the man advantage for the B’s. Boston went 2-for-4 with the man advantage, after getting shut out in the series opener. TUUKKA STILL SHARP. Tuukka Rask has only allowed one goal in each of the first two games of this series. He stopped 34 of the 35 shots he faced on Sunday afternoon. It’s too bad the one he didn’t stop on Friday night in Game 1 turned out to be the difference. Rask is playing like the Rask Bruins fans have grown accustomed to over the past few years. The series now shifts to Joe Louis Arena for Game 3 on Tuesday night, with faceoff set for 7:30 p.m.
After having their 12-game winning streak snapped by the Canadiens, the Bruins have started a new one. They’ve won three in a row – against the Blackhawks, Capitals and Flyers – and 15 of their last 16. Their road winning streak stands at nine. And they can also call themselves champions of the Atlantic Division. With his two goals on Saturday against the Caps, Jarome Iginla reached the 30-goal plateau on the season. It’s the 12th time in his career he has accomplished that. Patrice Bergeron has four goals in the last three games. Carl Soderberg has two goals and two assists during that span. David Krejci has three assists in the last two games. Tuukka Rask has won nine of his last ten starts, the lone loss coming at the hands of Montreal last Monday. His 49 saves against Philadelphia on Sunday were a season-high. The brackets have been announced for the NCAA Men’s Basketball Championship, and New England is well-represented. Four teams from the region are heading to the Big Dance. UMASS: it’s hard to believe it’s been 16 years since the Minutemen went to the tournament, but it has. Derek Kellogg is in his sixth season in Amherst, and this will be his first trip to the tournament as a head coach. Senior guard Chaz Williams will be a player to watch. He averages 15.8 points and seven assists per game. The Minutemen are one of six tournament teams to come from the Atlantic-Ten. UMass is the No. 6 seed in the Midwest. The Minutemen will tip off on Friday afternoon in Raleigh against the winner of the opening-round matchup between Iowa and Tennessee. UCONN: Kevin Ollie is in his second year as head coach in Storrs. After a year removed from postseason play, his Huskies are back in the tournament. UConn finished with a 26-8 record, and made it all the way to the championship game of the inaugural American Athletic Conference tournament, where it lost to Louisville. The headliner here is senior Shabazz Napier, who’s averaging 17 points per game. UConn is the No. 7 seed in the East, and will face St. Joseph’s in Buffalo on Thursday night. PROVIDENCE: entering the Big East Tournament, the Friars were on the bubble. They knew they probably had to run the table to secure the league’s automatic berth. And that’s just what they did, culminating their march to the Big Dance with an upset win over Creighton in the tournament final. It was their first Big East tournament title since 1994. 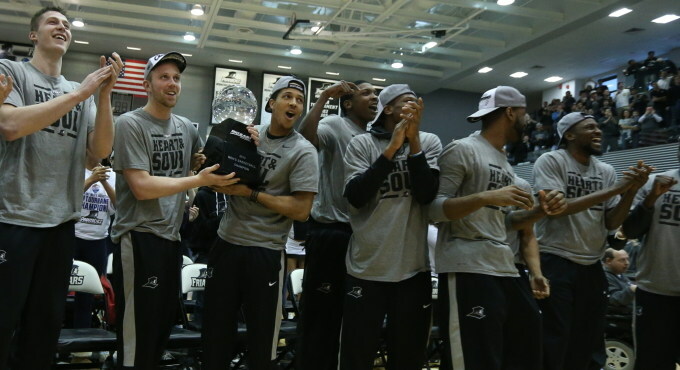 This is the first NCAA bid for Providence in ten years. Keep an eye on Bryce Cotton, who’s averaging 21.4 points per game, and was MVP of the Big East Tournament. The Friars are the No. 11 seed in the East, and will face the Tar Heels of North Carolina on Friday night in San Antonio. HARVARD: the final New England entry in the tournament was the first to clinch an automatic berth, when the Crimson won the Ivy League title outright. Tommy Amaker is taking his team to the Big Dance for the third year in a row. His team is riding an eight-game winning streak, and went 26-4 on the season. Five players are averaging in double-figures: Wesley Saunders, Siyani Chambers, Steve Moundo-Missi, Kyle Casey and Laurent Rivard. Last year, the No.14 seed Crimson pulled off one of the big upsets of the tournament when they beat New Mexico. This year, Harvard is the No. 12 seed in the East, and will travel across country to face fifth-seeded Cincinnati in Spokane on Thursday. 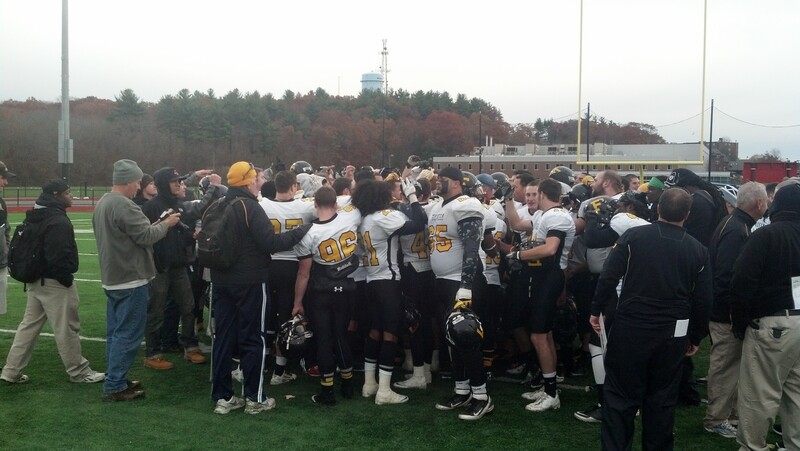 They wrapped up the title on Saturday afternoon with a thrilling, 35-28 victory over Bridgewater State. The decisive score came when Melikke Van Alstyne ran it in from nine yards out with just 29 seconds remaining. For a game that featured nine touchdowns in all, it started out as a defensive battle. The Rams got on the board first when Van Alstyne scored his first touchdown of the game from one yard out. The Rams led 6-0 after the PAT was blocked. The Bears responded with a 65-yard drive, capped off by quarterback Mike McCarthy’s five-yard run. The score remained 7-6 until the final minute of the half. That’s when the game turned into a shootout. Rams quarterback Matthew Silva found Jared Gauthier from 14 yards out. 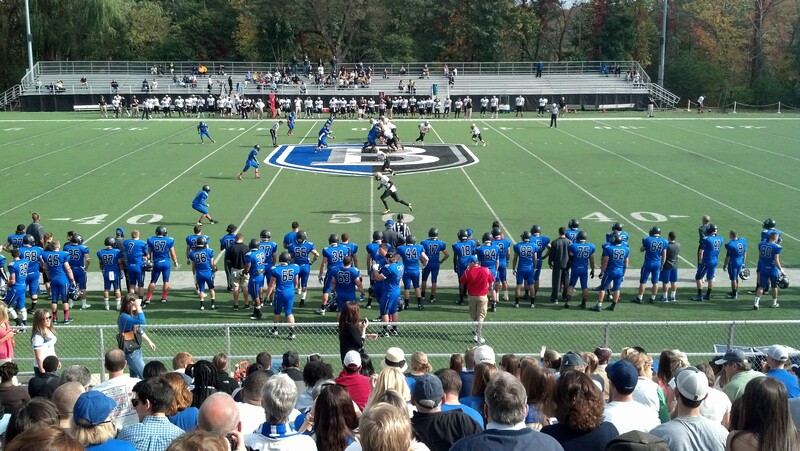 Gauthier out-jumped the defender, and Framingham State was back on top, 13-7, but not for long. The Bears got a good kickoff return, a personal foul on the Rams, a long pass play from McCarthy to Matthew Green, followed by McCarthy’s one-yard run, his second score of the game. Bridgewater State took a 14-13 lead into the locker room. In third quarter, McCarthy was picked off by Tyllor McDonald. The Rams capitalized on the turnover, with Van Alstyne scoring from a yard out to make it 20-14. Then, after McDonald intercepted McCarthy again, Gauthier’s 4-yard reception made it 27-14. “Our defense has come up big all year long, and they came up big again,” said Kelley. But McCarthy and the Bears would not fold. Playing in his final home game, he led his team 79 yards in 11 plays, and once again called his own number for his third rushing touchdown of the game. That made it 27-21. Late in the fourth quarter, the Rams appeared to stop the Bears on 4th and goal, but a pass interference penalty gave BSU new life. On the ensuing play, McCarthy appeared to be going into the end zone, but fumbled. Fortunately for the Bears, offensive lineman Mike Duran was in the right place at the right time, and fell on the ball for the touchdown. With 3:51 left, the Bears had re-taken the lead, 28-27. The difference in the game was the blocked PAT in the first quarter. But FSU would not panic. Silva calmly led his team 55 yards in seven plays, with Van Alstyne scoring the winning touchdown – his third of the game – in the final minute. The senior finished with 158 yards on 24 carries. Silva was 22-36 for 230 yards. The Rams celebrated the conference title on the field afterward. It was a heartbreaking Senior Day for McCarthy and the rest of his teammates. He rushed for a team-high 95 yards and threw for 117. Framingham State closes out the regular season at Worcester State, while Bridgewater State travels to Mass. Maritime. WALTHAM, MA – This game turned into the Kevin Arduino show. The junior quarterback for American International College ran for four touchdowns, and threw for another, as the Yellow Jackets defeated Bentley on Saturday afternoon, 42-14. With Stonehill beating New Haven, AIC moved into a three-way tie atop the Northeast-10 Conference. AIC scored first, and would never trail. After the Yellow Jackets recovered a Bentley fumble, they drove 41yards in seven plays. Hunter Beckmann scored from eight yards out to make it 7-0. That was the only AIC score in which Arduino was not involved. Later in the quarter, Arduino’s first score, a 1-yard run on a QB sneak, capped a 90-yard drive and made it 14-0. It stayed that way until the final minute of the half, when Bentley QB Danny Guadagnoli scored on a QB sneak of his own to put the Falcons on the board. AIC had a chance to increase its lead before the intermission, but Arduino was intercepted in the end zone by Sam McDonald on the final play. In the third quarter, Arduino provided the highlight reel play of the game. AIC had the ball on the Bentley 30. It looked like he would get sacked. But he broke a tackle, then another, and another. A few seconds later, he was running into the end zone to make it 21-7. The Falcons answered with a 71-yard drive, capped off by Jeff Hill’s leaping grab in the back of the end zone to cut the lead to seven. That would be the last time Bentley would score on the afternoon. From there, the Yellow Jackets broke the game wide open. Arduino scored his third rushing TD of the game, this time from seven yards out, to put AIC back up by 14. After another Bentley fumble, Arduino connected with Evan Graham on a 48-yard strike, with Graham making a superb diving catch in the end zone. Then in the fourth quarter, Arduino’s fourth touchdown on the ground, a 2-yard run, accounted for the final score. AIC came into the day leading the conference in rushing yards. The Yellow Jackets had 261 on the ground in this game, 129 of them from Arduino. He also threw for 222 yards. For Bentley, Guadagnoli was 22-36 for 279 yards. Hill had a nice game: nine catches for 124 yards. Next Saturday, AIC hosts Saint Anselm, while Bentley travels to Merrimack.